This past week I made my way over to the portait gallery in chinatown. I already knew who I wanted to write about before I got there. I’ve always been interested in Martin Schoeller’s work ever since I learned about him in high school. This contemporary, german photographer is well known for working with Annie Leibovitz and for his large scale, close up portraits of celebrities and people. When first walking into his exhibit, it’s a little overwhelming. You’re surrounded by very large, very bright body-less heads floating. Schoeller chose to shoot some of his portraits in black and white, but the ones that striked me the most were the colored photos. Other than the fact that the camera is extremely close to the subject’s face to the point of seeing every wrinkle and imperfection, I think the color photos help to capture even more detail from forehead to chin. 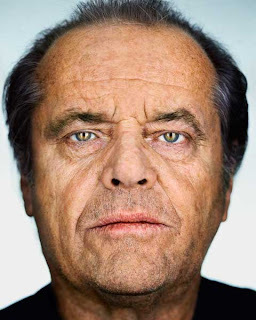 The image that stood out to me the most was of Jack Nicholson. I feel like Schoeller very easily could have chosen to capture the actor with his infamous grin, but decided to take another aproach and shoot him with a more serious, straightforward pose, not unlike his other subjects. It’s interesting to see this side of Nicholson. Schoeller portrays the actor as a human being rather than as this persona that he has made for himself. Seeing all the celebrities close up like this makes them rather vulnerable. There’s no hiding behind shades or hats, no caked on makeup to hide their imperfections, it’s refreshing. I definitely recommend this exhibit to you guys, there are also other great images that are part of Portraiture Now that are worth checking out, including Steve Pyke’s outstanding black and white images.